I hadn’t planned on any further Postal Patchwork experiments just yet, but I had a reason to sneak this one in between some other projects. I’m about to disappear off to Ireland for a few days to visit my aunt, who is also my godmother (I call her my Fairy Godmother, although I’m not sure how much she appreciates that…) and wanted to take a small gift with me. So I chose greens for the Emerald Isle (and also because I’m pretty sure she is fond of greens) and pieced together this little notebook for her. Another crafternoon with Britta produced lots of fun results! Of course, my new Postal Patchwork experiments paled somewhat beside Britta’s amazingly detailed hand-carved stamps – applied to Moleskine notebooks, so we can all share the goodness! 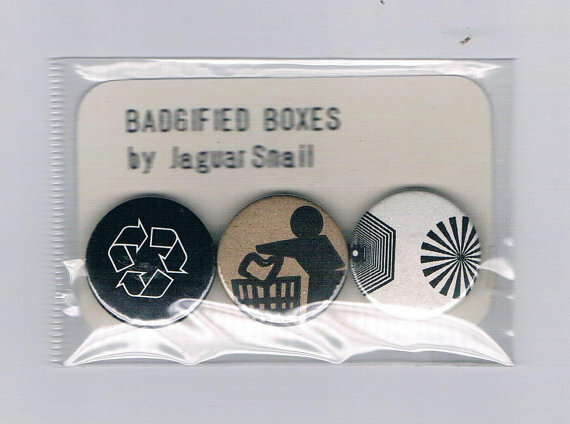 As if that wasn’t enough, Britta presented me with a little stash of badges she’s been working on, made from the quality control marks & recycling logos on salvaged packaging (‘Badgified Boxes‘, as we decided to call them!). We worked together on the presentation, hand-cutting mount cards from discarded packaging lying around TangleCrafts HQ, together with low-fi hand-stamped title & by-line, using my DIY printing kit. We had a fun afternoon (topped off by pizza! 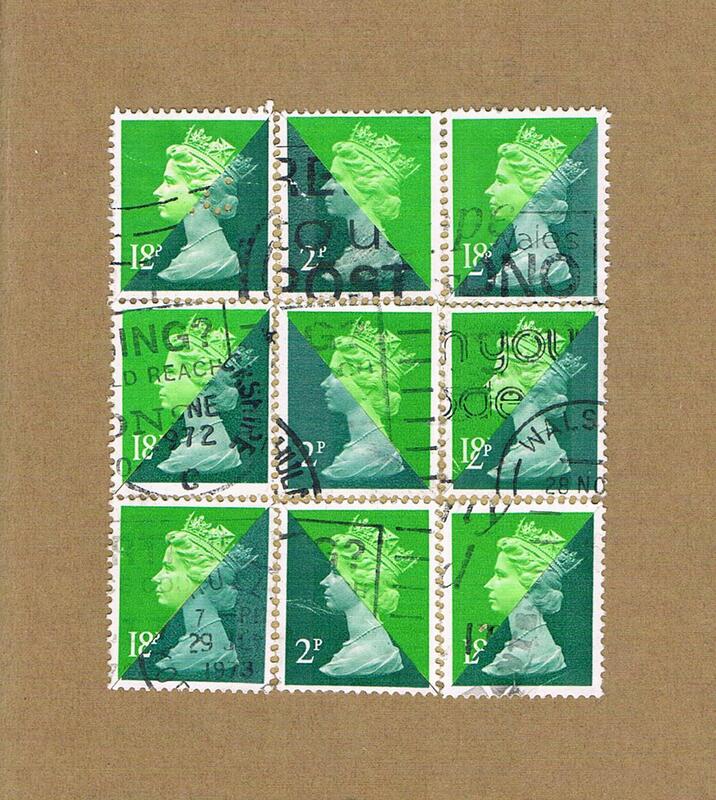 ), and I was inspired to carry on with a little more Postal Patchworking the next day. This one is a postcard, and I’m thinking of putting together a tutorial zine & possibly kit so that you can try it out yourself. 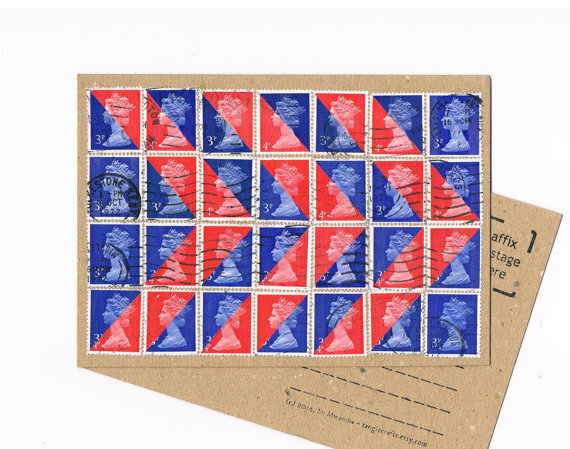 As soon as I started laying down the stamps for the above ‘airmail’ arrow pattern, I started visualising alternative pattern variations which are crying out to be tried. 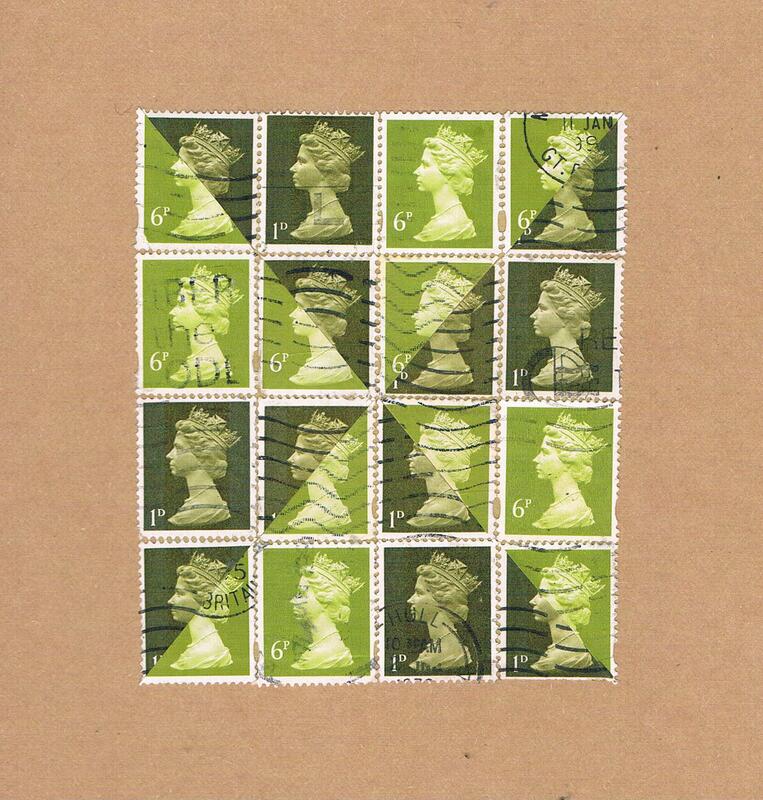 The problem with this Postal Patchworking – with any kind of patchworking, probably – is that there is an almost infinite number of variations for every pattern, and it’s simply impossible to act on them all! I’m suffering slightly from ideas-overload at the moment, so am planning to scale back again on PP experiments while I try to let some of the other ideas that are buzzing around in my head chance to breathe (before they just spill out of my ears…). Watch this space (&, of course, the TangleStore) for the results! I’m loving the way the colours play against each other when the halved stamps are realigned with their mismatched partners! I’ve sketched out lots of sample patterns, and have found myself far happier with designs measuring 4 x 4 stamps rather than 3 x 3 (or 3 x 4), due to the 4-way (and/or symmetrical) nature of this type of geometric patchwork pattern.